I have added a patreon button to the site. CONGRATULATIONS TO PACKRAT @ #10,000! mrneilypops - What a Guy! and no google sh!t anywhere. laudable. By far the slickest image hosting I've used, well deserved. Congrats and thank you for the service! @mrneilypops is there any api access to scrot.moe? I'd like to be able to upload images from a script. this has NEVER happened until now, with the same settings in the same browser. @ohnonot & @mrneilypops I'm now getting a big noscript warning popup, referring to a certain image, as soon as I open Firefox! Even without visiting any page with scrot.moe hosted images. The only recent change was the addition of a patreon button to the home page. I have temporarily removed this. i'm still getting exactly the same as described in my previous post. it seems to be the same image, the Gaia---screenshot.png. [NoScript XSS] Sanitized suspicious request. Original URL [https://cdn.scrot.moe/images/2018/11/05/Gaia---screenshot.png] requested from [https://scrot.moe/image/9hs9D]. Sanitized URL: [https://cdn.scrot.moe/images/2018/11/05/Gaia-screenshot.png#5518958446656822370]. 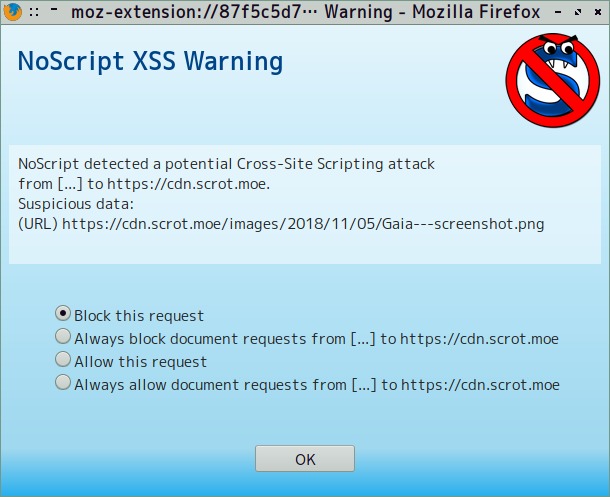 [NoScript XSS] Sanitized suspicious request. Original URL [https://cdn.scrot.moe/images/2018/11/05/Gaia---screenshot.png] requested from [https://scrot.moe/image/9hs9D]. Sanitized URL: [https://cdn.scrot.moe/images/2018/11/05/Gaia-screenshot.png#6821784149821626523]. i had hoped you would at least take a closer look at the log. why i have no idea, but it seems clear that it's a noscript problem, specifically their XSS protection. Ah - those three dashes are actually in the URL! I assumed noscript was abbreviating something longer. I just downloaded a copy of https://cdn.scrot.moe/images/2018/11/05 … enshot.png and ClamAV didn't find anything in it.